The goal of the paper was to test if humans can detect whether athletes are trailing or leading in sports based on the perception of thin slices of athletes’ nonverbal behavior. In Experiment 1, participants who were unexperienced in the respective sports watched short videos depicting basketball and table tennis players and rated whether athletes were trailing or leading. Results indicated that participants could significantly differentiate between trailing and leading athletes in both team and individual sports. Experiment 2 showed that children were also able to distinguish between trailing and leading athletes based on nonverbal behavior. Comparison with the adult results from Experiment 1 revealed that the adult ratings corresponded to a higher degree with the actual scores during the game compared to the children’s. In Experiment 3, we replicated the findings from Experiment 1 with both expert and unexperienced participants and a different set of stimuli from team handball. Both experts and unexpert participants were able to differentiate between leading and trailing athletes. 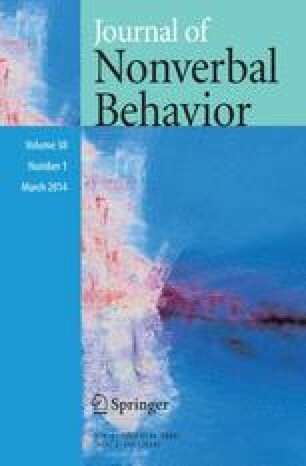 Our findings are in line with evolutionary accounts of nonverbal behavior and suggest that humans display nonverbal signals as a consequence of leading or trailing which are reliably interpreted by others. By comparing this effect as a function of different age groups we provide evidence that although even young children can differentiate between leading and trailing athletes, the decoding of subtle nonverbal cues continues to develop with increasing experience and maturation processes. Special thanks go to Manuel Thiel, Christoph Haberl, Christoph Sobotta, and Wolfgang Walther for helping with the data collection and programming in this study. Further we would like to thank William D. Furley for copy editing the manuscript.